DULLES, Va.--(BUSINESS WIRE)--During the 34th annual Space Symposium in Colorado Springs, Colorado, Orbital ATK (NYSE:OA), a global leader in aerospace and defense technologies, today provided a detailed update on the important progress being made on its Next Generation Launch System. The company reaffirmed its commitment to the U.S. Air Force’s Evolved Expendable Launch Vehicle (EELV) program for national security space missions with the announcement of the name of the rocket, OmegA, and the selection of its upper stage propulsion system. As one of the company’s largest strategic investments, OmegA will provide intermediate- to heavy-class launch services for Department of Defense, civil government and commercial customers beginning in three years. Over the last three years, Orbital ATK and the U.S. Air Force have together invested more than $250 million in developing the OmegA rocket, and the company has committed to an even larger additional investment to complete its development and certification. Orbital ATK is already building major propulsion and structural elements with a program workforce of about 500 employees. 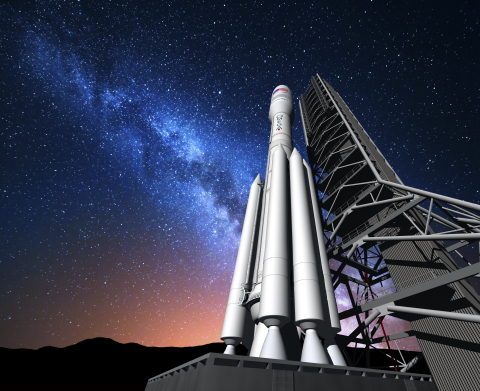 OmegA is on schedule to complete propulsion system ground tests in 2019 and to conduct its first launch in 2021. The rocket configuration consists of Orbital ATK-built first and second solid rocket stages, strap-on solid boosters and a cryogenic liquid upper stage. After careful consideration, Orbital ATK recently selected Aerojet Rocketdyne’s RL10C to be OmegA’s upper stage propulsion engine. Orbital ATK has a long history of launching critical payloads for the Department of Defense, NASA and other customers with the company’s Pegasus®, Minotaur and AntaresTM space launch vehicles as well as a wide array of strategic missile interceptors and targets in support of critical national security launch programs. “We currently have 10 launch vehicle product lines that are in active production and operations for our government and commercial customers, leveraging the efforts of one of the industry’s most experienced launch vehicle development and operations teams,” said Pinkston. The company has built and delivered about 160 space and strategic launch vehicles and approximately 275 target vehicles in the past 35 years, with current annual production rates totaling about 20 vehicles per year. Approximately 500 employees are currently working on OmegA, a number that is expected to grow to about 1,000 people over the next 18 months. The company’s development team is working on the program in Arizona, Utah, Mississippi and Louisiana, with launch integration and operations planned at Kennedy Space Center in Florida and Vandenberg Air Force Base in California. The program will also support hundreds of jobs across the country in its supply chain. The next phase of the OmegA program is expected to begin when the U.S. Air Force awards Launch Services Agreements in mid-2018, which will include the remaining development and verification of the vehicle and its launch sites. After initial flights of its intermediate configuration in 2021, OmegA will be certified for operational EELV missions starting in 2022 with initial heavy configuration flights beginning in 2024.